Just What Does Local Mean? Can Local Food Go Mainstream? Do Government Policies Grow Local Food? The United States has experienced a rapid increase in consumer interest in purchasing locally grown foods. This trend has led to many changes in the food system. For one, from 1994 to 2009, there was a 201% increase in the number of operating farmers’ markets, with most featuring local products (USDA, AMS, 2009). Additionally, in 2007, over 12,500 farms marketed products through a Community Supported Agriculture arrangement, where for a predetermined fee consumers receive a portion of the local farm’s total harvest (USDA, NASS, 2007). The emergence of local can even be witnessed in the marketing activities of snack-food giant Frito-Lay, who in 2009 made “Lay’s Local” their primary promotional campaign. Alongside the local food trend, there has been a great expansion in state-sponsored agricultural marketing programs. While prior to 2000 less than half the states had such programs, now they exist in all fifty. Designed to increase consumer demand for local products, these state-sponsored programs have varying components. The majority encompass both food and agricultural products under their state logo. Qualifications by state differ, and products may need to be grown, processed, or manufactured within the state, or a combination of these three depending on the product and state. It appears that states have caught the “local” bug. Despite this, limited investigation has been conducted regarding the details of each state’s program. The purpose of this article is to explore the various approaches states have taken in the establishment of their programs and examine evidence of how well they may be capturing the local foods consumer. For evidence of their effectiveness, some results from a survey of Mid-Atlantic states on program awareness and purchasing are presented. From the launch of Vermont’s Vermont Seal of Quality program in 1980, the number of states unveiling agricultural marketing programs has steadily increased. Establishment dates for the current or primary program were available from 48 states and can be viewed in Table 1. While 27 of these were established in 2000 or later, for some states these represent second attempts at state promotion. Notably, all but one, Indiana Premium Forest Products, include food products. Table 1 additionally presents each program’s slogan and information on the minimum percentage from within the state a product must contain to participate. Of note, 64% of programs have no minimum percentage requirement stated in publicly available materials, meaning consumers can not be sure state program labeled products are entirely local. Slogans and logos are a key marketing aspect for state programs and interesting similarities and differences in approaches can be seen in examining them. In terms of slogans, 16 states include use of the words “grow” or “grown.” By highlighting a product as grown within the state, these programs recognize some consumers will consider a product bearing their logo to be local. The most common logo characteristic, involving 19 states, employs either a picture or the shape of the state. By using the image of their state, these programs may be seeking to develop a sense of trust with consumers by utilizing familiarity. While the term local is often used without a firm definition, state boundaries could serve as a natural demarcation in the minds of consumers. Additional similarities in wording can be seen in Figure 1. Another design aspect involves the amount of detail displayed in the logo. 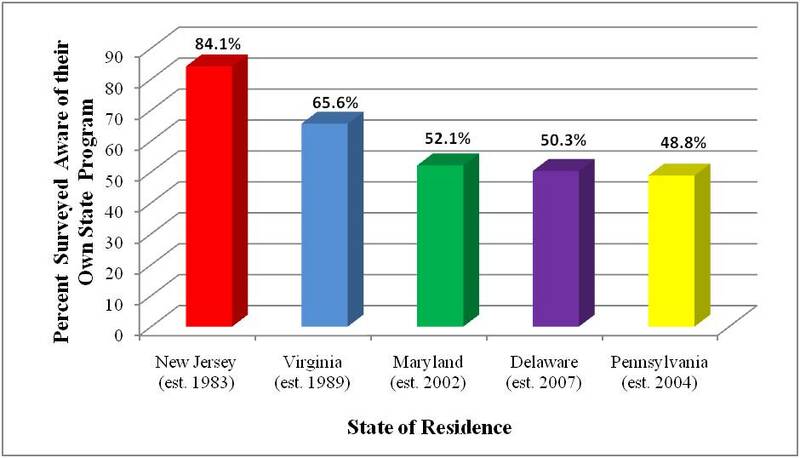 States with newer programs such as Delaware feature a logo with intricate detailing as seen in Figure 2. Henderson and Cote (1998) found such elaborate logos to be effective at retaining consumer interest. However states with well established programs, such as Texas, utilize a simple logo. The Go Texan logo appears in Figure 3. Other research involving effective logo design suggests logos with a simpler design are often processed more easily by the observer (Janiszewski and Meyvis, 2001). 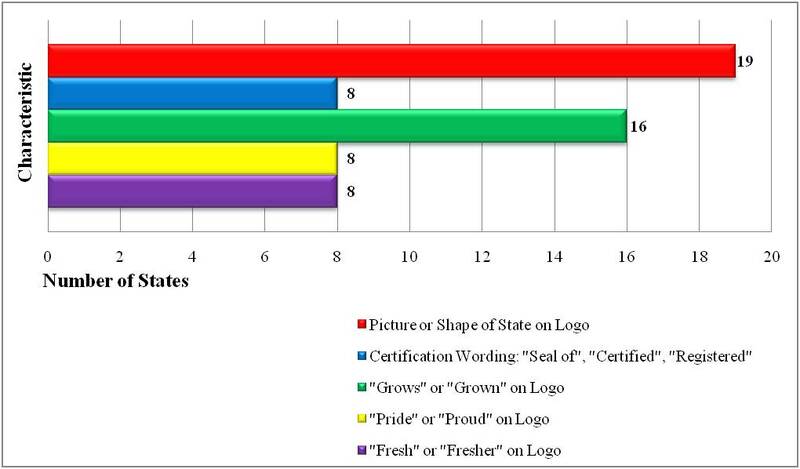 Whether simple or complex logo designs are more effective for state marketing programs remains an area for investigation. A few states have also included their specialty as a way to differentiate their program. Louisiana, for example, has designed additional logos to brand Certified Louisiana Creole and Certified Louisiana Cajun. Oklahoma’s Made in Oklahoma program features a Native-American inspired logo to incorporate their region’s cultural heritage. Montana, Colorado and Vermont are examples of programs with state-specific organic logos, which are displayed on products in conjunction with the USDA organic logo. While Colorado and Vermont also have other logos in use, Montana’s sole logo remains Montana Department of Agriculture Certified Organic. As Montana is a leader in the production of several organic grains, they too are incorporating their specialty to their advantage. Vermont is currently the only state known to have in place a state-specific local logo. Their Buy Local program includes a state definition for local: “a product grown within 30 miles of the place of sale, or within the State of Vermont” (Vermont Agency of Agriculture, 2009). With evidence that consumers may place greater value on local production over organic production, we may see more state-specific local logos than organic logos in the future (Thilmany, Bond, and Bond, 2008). Organic products however were found by Stegelin (2008) to make up a significant portion of “local” products purchased by consumers. Historically programs have been primarily funded in conservative amounts by state legislatures; although federal support through the Emergency Agricultural Assistance Act of 2001 helped many finance their initial program set-up (Patterson, 2006). Such federal funding could be a competing explanation for the rapid growth of state programs since 2001. While almost 90% of these programs are administered by the state’s agency or department of agriculture, there are a few exceptions. Programs in Alabama and Indiana are administered by state commodity and trade associations. Comprised of industry members, these associations may have a more vested interest in the program, and the ability to accept member donations as a source of funding. In the case of Indiana, with the focus on local forest products, the program benefits from exposure to outside markets as well. However, state programs often promote more than one product area. Administration under a commodity association may prevent state products from gaining exposure in the local market, as local markets often are a minor component of the commodity’s overall market potential. State programs should exhibit caution when exploring such an option. In Oregon and Wyoming, a nonagricultural agency runs their state programs—the Oregon Economic and Community Development Department, and the Wyoming Business Council. These larger agencies may have more resources available and receive more public exposure. As another alternative, nonprofit organizations and partnerships have been established in Rhode Island, New Hampshire and Nevada for the promotion and administration of their state’s marketing programs. Rhode Island’s nonprofit encourages tax-deductible contributions to their program, as well as provides a network of farmers with delivery routes to catering services and restaurants throughout the state. New Hampshire’s nonprofit prefers to fund activities through membership fees, which allows members to sell their products in the program’s two retail stores, operated in close proximity to the state’s major interstate highway. By establishing nonprofits, these states are able to add program components that traditional state agencies would be unable to provide. Is Quality the Key to Success? 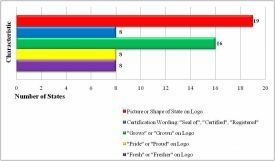 Certification and the regulation of products bearing a state program’s logo has long been a topic of debate. At present, New Jersey and California have in place some of the most stringent certification and program regulations. Both have also experienced some of the largest increases in product sales. New Jersey requires products bearing the Jersey Fresh logo to be registered and meet quality standards “equal to or better than U.S. No. 1” (State of New Jersey, NJDA, 2009). California has participants complete separate licensing and compliance agreements, ultimately calculating the amount per year the company will be required to pay to use the logo based on their overall industry share and net value. Many programs require participants to sign some type of licensing or membership agreement, stating their program logo may only be displayed on products of the highest quality. However, few programs enforce such mandates. With state competition becoming fiercer, the quality of products bearing state logos will undoubtedly come under scrutiny by both consumers and competing state programs. Jekanowski, Williams, and Schiek (2002) found the perceived quality of a local product had the strongest impact on purchasing likelihood. They emphasized that if state programs allowed their quality standards to fall below those of competing states, such a state would essentially be branding their products as “lower quality.” Programs may find themselves having to adopt quality grading and certification processes to remain competitive. With all the competing state programs, the question of their effectiveness remains. One concern is the extent to which consumers are aware of their state’s program. Another would be if products with these programs’ logos can capture the consumer seeking local foods. To investigate these, a mail survey was conducted in fall 2009 of consumers from five Mid-Atlantic states: Delaware, New Jersey, Maryland, Virginia and Pennsylvania. Addresses for 1,000 consumers from each state were purchased through USA Data and the response rate was 39.5%. 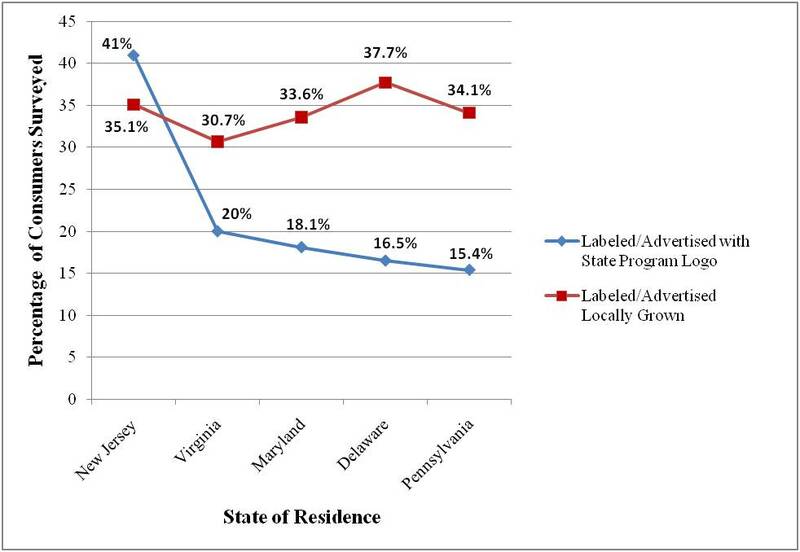 Consumers’ awareness of their state program is presented in Figure 4. Consumers in New Jersey had the highest awareness of their state program at 84.1%. Virginia consumers also exhibited significant program awareness for their state program at 65.6%. Both of these programs were established in the 1980’s. Newer programs thus appear to have a way to go in terms of recognition. Consumers were next asked on a five point scale how often in an average month they purchased food products labeled or advertised as “locally grown,” and labeled or advertised with their state program. The percentage of consumers by state who responded “often” or “very often” are presented in Figure 5. 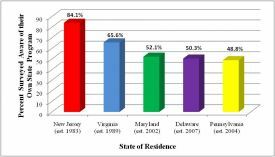 With the exception of New Jersey, a higher percentage of consumers purchased locally grown food than state program labeled food. Two possibilities exist for this. Consumers either cannot find or are not familiar with products advertised under their state’s marketing program. In this case the gap represents sales opportunities for the state marketing programs. It may be that consumer interest is more focused on local, and that their definition of this may be different than the border of their state. Some consumers might consider the visit to a farmers’ market or farm stand as part of the value in purchasing local, in which case the purchasing venue might be of most importance. With all fifty states having marketing programs, it appears they have caught the “local” bug. As discussed, there are many different marketing approaches, funding sources and requirements. Program similarities, such as including fresh and processed food products, as well as membership and participation agreements, will undoubtedly remain. However, programs lacking a formal certification process may move towards such a process if their program expands, and funding improves. For the numerous programs with no minimum percentage requirement stated, consumers may start to question the authenticity of and meaning behind the logo. State programs might benefit from developing clearer eligibility requirements, and subsequently educating consumers. In attempting to differentiate, states able to do so will look towards incorporating their state’s and/or region’s specialty into their program in the hopes of capturing consumer interest. Unfortunately, given awareness and purchasing issues, it may be that not all state programs survive. For instance, Delaware’s program was cancelled during preparation of this article, showing the difficulty in capturing the local foods consumer with a state marketing program. In order to remain competitive in a market saturated with state-specific brands, programs will likely need to adopt quality grading programs to create a sense of value for their brand. State-sponsored agricultural marketing programs will continue to evolve. It may be that more put into practice a state-specific local or organic logo in an attempt to increase consumer interest or premiums for their products. Nonprofit organizations may be established in increasing numbers as programs look for alternatives in management and funding. More program partnerships with other state agencies, commodity groups and industry organizations may similarly be witnessed. Lastly, competition beyond other state’s programs may become an issue. With other local labeling programs such as the national Buy Fresh Buy Local promotion appearing in increasing numbers, consumers will be seeing many messages about local. How these interact and affect state-sponsored programs will be interesting. Henderson, P. W., and Cote, J.A. (1998). Guidelines for selecting and modifying logos. Journal of Marketing, 62(4), 14-30. Janiszewski, C., and Meyvis, T. (2001). Effects of brand logo complexity, repetition, and spacing on processing fluency and judgment. Journal of Consumer Research, 28, 18-32. Jekanowski, M.D., Williams, D.R., and Schiek,W.A. (2002). 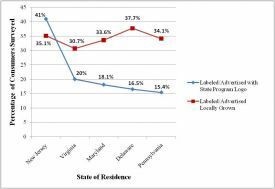 Consumers’ willingness to purchase locally produced agricultural products: An analysis of an Indiana survey. Agricultural and Resource Economics Review, 29(8), 43-53. Patterson. P.M. (2006). State-grown promotional programs: Fresher, better? Choices, 21(1), 41-46. State of New Jersey, Department of Agriculture (NJDA). (2009). Jersey Fresh Quality Grading Program. Available online: http://www.state.nj.us/agriculture/divisions/md/prog/jfqgp.html. Stegelin, F. (2008). Consumer understanding of buying local, fresh, and safe. Presented at the 2008 Conference of the Food Distribution Research Society, Dublin, Ohio. Thilmany, D., Bond, C.A., and Bond, J.K. (2008). Going local: Exploring consumer behavior and motivations for direct food purchases. American Journal of Agricultural Economics, 90(5), 1303-1309. U.S. Department of Agriculture, Agricultural Marketing Service (AMS). (2009). Farmers market growth: 1994-2009. Available online: http://www.ams.usda.gov/. U.S. Department of Agriculture, National Agricultural Statistics Service (NASS). (2007). 2007 Census of Agriculture-State data. Available online: http://www.agcensus.usda.gov/. Vermont Agency of Agriculture, Buy Local Buy Vermont. (2009). Overview of ‘local’ labels and their meanings. Available online: http://www.vermontagriculture.com/buylocal/marketing/buylocal.html. Kathryn Onken (konken@udel.edu) is a graduate student in the Department of Food and Resource Economics, University of Delaware, Newark, Delaware. John C. Bernard (jbernard@udel.edu) is Professor in the Department of Food and Resource Economics, University of Delaware, Newark, Delaware. The Texas Department of Agriculture (TDA) and the Go Texan Program, as well as the Delaware Department of Agriculture (DDA) were in no way involved with the preparation of this article. The views expressed here do not represent the views of the TDA, the Go Texan Program, or the DDA. University of Delaware funds for this project were matched with Federal funds under the Federal-State Marketing Improvement Program of the Agricultural Marketing Service, U.S. Department of Agriculture.